From acoustic contemporary pop to jazz and covers from the 70s, 80s, 90s and today – be here for our #Live Music Weekends! The Oasis House Band is always down for a little Blues, Oldies, Classic Pop and more! Come see artists like Forrest Sean Hartmann – Forrest Hartmann Music, Dawson Hollow, Arbour Season, Michael Chauncey & so many more! Meet the artists, enjoy evening #coffee & dessert, wind down over a soup and sandwich or try one of our hand-crafted Oasis sodas. $10 entry fee per act – One date remains this year: December 4th. 6:30pm – 9:00pm. 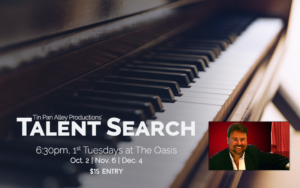 Tin Pan Alley Productions Talent Agency is hosting a talent search here at The Oasis. They are seeking singers and performing artists of all ages. The purpose of the talent show is to increase interest in the performing arts and to provide a platform for rising stars to perform for a welcoming audience. Professional judges will participate, prizes will be awarded and you will be showcased in future shows. 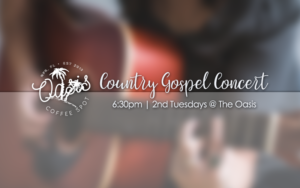 Enjoy a Country Gospel concert on the second Tuesday of each month! 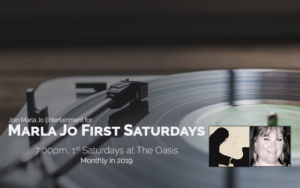 Lois Johnson opens for award-winning vocalist John Osborne. Don’t miss hearing your country favorites while winding down over dinner and an evening coffee at The Oasis! You’re invited to an evening of singing, comedy and impressions! 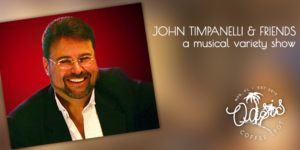 This free monthly concert on the third Tuesdays features John Timpanelli (of Tin Pan Alley Productions Talent Agency) and his very talented friends. Gather with family and friends to experience an evening of great music and entertainment. They will be accepting a love offering.